This month, February, we're going to study the sayings of Oscar Wilde, the Irish Dramatist, and how they can be applied to sourcing. 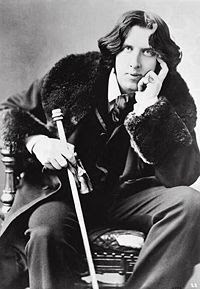 Oscar Fingal O'Flahertie Wills Wilde (October 16, 1854 – November 30, 1900) was an Irish playwright, novelist, poet, and author of short stories. Known for his barbed wit, he was one of the most successful playwrights of late Victorian London, and one of the greatest celebrities of his day. As the result of a famous trial, he suffered a dramatic downfall and was imprisoned for two years of hard labor after being convicted of the offense of "gross indecency." What does this quote mean and how is it applicable to sourcing? Sourcers! Don't be left out. Get listed in the 2008 Book of Sourcers! Do something today you don’t think you can do. Lose phone fear here. What does this say to you about sourcing? Looking for information on phone sourcing? "Going forward, 23 percent of employers plan to add full-time..."